Today, I am going to explain in details about dependency injection in C#. This article is for those developers who don't know anything about Dependency Injection (DI). Just go through below all the example along with code comments to get a better understanding of DI. Today, I am going to explain in detail about dependency injection in C#. This article is for those developers who don't know anything about Dependency Injection (DI). Just go through all the examples below along with code comments to get a better understanding of DI. Before we start DI, let's understand what tightly coupled is in C#. If you are familiar with tightly coupled, then skip this section. Tight coupling is when a group of classes are highly dependent on one another. See the below example which is tightly coupled. //and CurrentAccount class to call the PrintData() method of each. The account class is tightly coupled as every time, we need to create the instance of both SavingAccount and CurrentAccount class to call the PrintData() method of each. So it is highly dependent on either SavingAccount or CurrentAccount class. Now the question is, how to avoid this tightly coupled state? The answer is by using Dependency injection. DI is achieved using interfaces. What is Dependency Injection in C#? I am not discussing the "Service Locator Injection". Let us understand constructor, setter or property, and method injection with an example. Constructor injection is nothing but the process of injecting dependent class object through the constructor. What is meant by this? 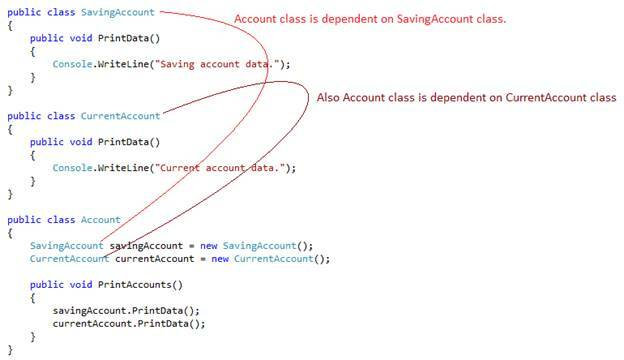 In the above example, the account class has a dependency on SavingAccount & CurrentAccount classes. 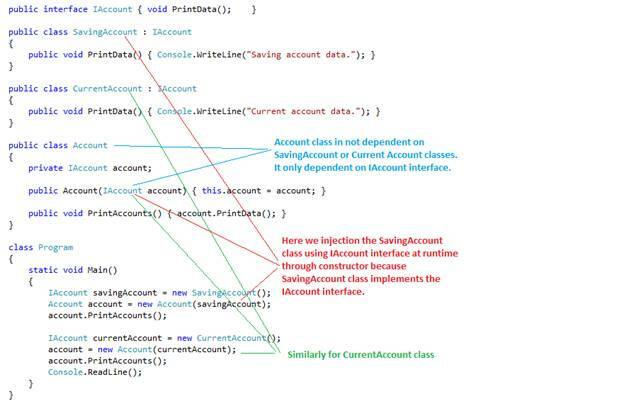 So constructor injection means, injecting SavingAccount & CurrentAccount class objects in Account class constructor using interface. Let us see how we can do this. //Created IAccount interface to make code loosely coupled. //Account class is not depended on any other classes. //So now it is loosely coupled. //pass as parameter to Account constructor. Here, I have created a separate "IAccount" interface to make the code loosely coupled. So, we have to use "IAccount" interface to inject SavingAccount & CurrentAccount class objects in Account class constructor. That's why I have Implemented the IAccount interface in SavingAccount and CurrentAccount. If you see the code the "Account" class, there is no class object created. Hence, Account class is not dependent on any other classes and now it is loosely coupled. I have passed the "IAccount" interface as a parameter to "Account" class constructor to implement constructor DI. In the main method, If you want to calls the SavingAccount class PrintAccounts() method, just create the object of SavingAccount() and pass as a parameter to Account constructor. Similarly, In the main method, If you want to call the CurrentAccount class PrintAccounts() method, just create the object of CurrentAccount () and pass as a parameter to Account constructor. Hence, now there are not classes dependent on each other. Setter or property injection is injecting dependent class object through the property. So setter or property injection means, injecting SavingAccount & CurrentAccount class objects in Account class using property. Here the property type will be an interface. Let's see, how we can do this. Method Injection is injecting dependent class object through a class method. What is mean by this? In the above example, Account class has a dependency on SavingAccount and CurrentAccount classes. So the method Injection means, injecting SavingAccount & CurrentAccount class objects directly into the Account class method user interface. Let's see how we can do this. //to Account class method (i.e PrintAccounts(new SavingAccount())). I hope now you are very familiar with DI and types of DI.